New Shower Enclosures don't come any better than those from Coram. When you need to install a new shower enclosure or even a replace a shower enclosure then we have a great UK made range for you. 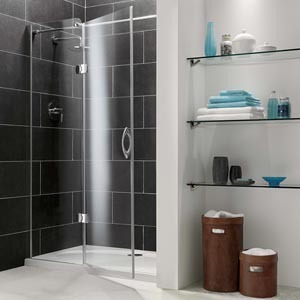 Coram Showers are the UK's leading specialists in the design and manufacture of shower enclosures, shower trays and bath screens. Manufactured in Shropshire, Coram's extensive range covers, Pivot Doors, Bifold Doors, Sliding Doors and even minimalist Glass Panel systems. They also offer White and Silver shower enclosures with various glass finished too. Designed and built in Britain, Coram Shower Enclosures are the fastest to be delivered and easiest to fit, which is why they are the choice of more professional installers than any other. This also means that DIY novices won't find them a problem either. All Coram Shower Enclosures are built to last and all come with rock solid 10 year guarantee. Want to get some advice on which enclosure would be best for your bathroom ? Call our Shower Enclosure Expert Steve on 01527 522 522 for free advice.